To prepare for my trip, I just exchanged some dollars for euros at my local bank. 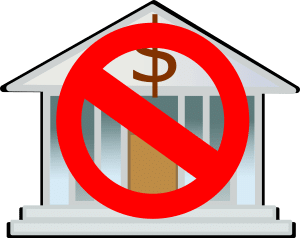 While we own euros in one of our investment accounts, I needed cash and there was no easy way to actually get cash out of that account. I figured I’d get a bad deal, but it was worse than I expected. On a day where the mid-market rate for euros was in the 1.105 range, I had to pay 1.145 at the bank. That’s a fee of about 4%. I’m glad I have a better way to do it for large amounts. Working through my investment advisor and Fidelty, we pay only 0.3%. I think we’d only pay 1.0% on a smaller amount. Next time, I’ll see if I can do an exchange and get euros in cash through Fidelity. www.pixabay.com License: CC0 Public domain. Free for commercial use. No attribution required. It looks like the residency question has sorted itself out, just a few days before a decision had to be made. 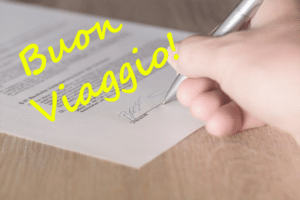 Remember, the big reason to consider becoming a formal Italian resident is financial: we can save 7-9% of the purchase price when a resident, or 30,000-40,000€. But it makes us liable for Italian taxes on both income and assets. Financially, it’s probably more or less a wash on income tax. The rates in the US and Italy seem comparable for unearned income, and we can deduct the Italian tax on our US return. The financial problem is on assets. 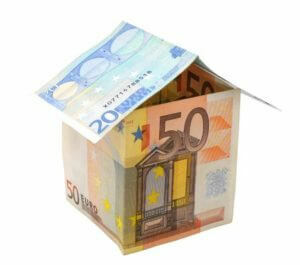 The Italians tax worldwide financial and real estate assets. These taxes we can’t deduct in the US. But here’s the practical resolution, which I hadn’t understood clearly before: we’d need to become residents within 18 months of the time we sign the purchase and construction contracts. That puts us in the spring of 2018, well before we’d be able to be there for long enough of an extended period to become residents. So we’ll have to bite the bullet and pay the extra taxes. Kevin and I had a Skype call this morning to iron out a few details of my upcoming trip. The main purpose of the trip is to sign the final documents and to get the property transferred into our names. He also wanted to just recap the project budget. We started with a basic schedule. I plan to depart Chicago on the evening of Sunday, October 23. Rather than flying to Rome and driving 3 1/2 hours across the mountains, I’m going to fly into Ancona, on the coast about an hour from the property. Also, when I looked into flights, surprisingly to me, only American has a nonstop to Rome this time of year and it’s very expensive. So I’d have to connect somewhere, so I might as well connect and go to Ancona. My plan is to use United miles and connect through Munich to Ancona. That gives me a 9:20pm departure, 5:00pm arrival in Ancona on Monday evening, October 24. Then Tuesday we’d walk the property and decide where to place the house and discuss related issues. Late in the afternoon we have an appointment at a windows and doors place. Apparently, we have to make some decisions about these early in the process. I need to figure out a way to get Anne’s input in a timely manner. .
Wednesday, the atto (closing) is scheduled in the afternoon. Kevin also wants to discuss flooring, so I assume we’ll visit a showroom of some type. Kevin made a great suggestion. He’s planning on having us visit some completed houses to focus on windows, doors, and flooring. On Thursday, I think we’ll get into some details about project timing and planning. He’s then leaving that afternoon to go out of town. I can come back on Friday, but it seems if I gone over there I should stay a bit and accomplish a few more things, but this is all TBD at this point. But I haven’t yet booked the trip yet. The plan for today, after the call with Kevin, was to complete the wire transfer and then book this flight. But the call went differently than either of us expected. We began to discuss the project budget and we both were surprised and confused. Since Anne is not going with me to sign the purchase agreement for the property, I need to have a power of attorney, or procura speciale. Giovanna sent me the proper documents, in both Italian and English. She said to have Anne sign them and get them notarized. Then she said I also need to get an apostille for each document. 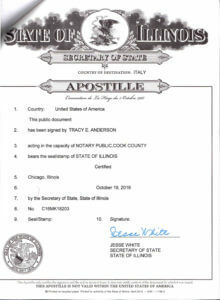 It’s a certification by the state that the notary is a notary and is commonly used when sending documents to foreign countries. 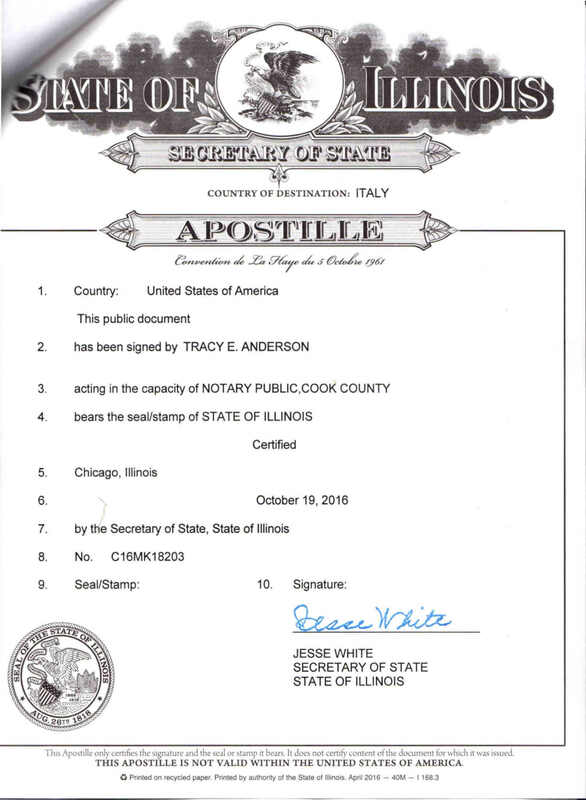 Giovanna thought I needed to ask the notary to get the apostille, but my research showed I could do it, through the Illinois Secretary of State. I could mail it to the state capital, Springfield, or go in person to an office in Chicago. Unfortunately, Giovanna had sent the documents to me too late for me to get it via return mail. So I needed to make a trip downtown. I was dreading this step, figuring that I’d need to stand in line and wait a long time to get the documents processed. As it turns out, waiting wasn’t the problem I encountered. There was no line and a friendly employee took my documents right away . . . and told me she couldn’t give me the apostilles. The problem was with the notary’s certification. She had just stamped and signed the document, but it needed to have a boilerplate statement included about who signed and when. The notary had not included this, so I had to return home empty-handed. It seems that a document prepared here includes this statement as a matter of course, but I do think the notary should have noticed something was amiss when she certified Anne’s signature. I added the right text and Anne went and got the documents notarized again. I was off to Chicago again, wondering what I’d be missing this time. Fortunately, smooth sailing. In about 10 minutes, I had my documents with apostilles and should be set for the contract signing next week. Following on a discussion about the budget where Kevin’s numbers were higher than I expected and he seemed to be confused about what he told us originally, he sent me a “line-item” budget with the revised numbers.For the whole project, including land but not taxes. The new figure is 12% higher than the high end of the original range. The largest unfavorable variance is in professional fees. I had assumed that these were included in the total, but it’s possible they were supposed to be an addition. They total 7% of the budget. The build cost of the project is also higher, by 4%. I expected an increase in this number when I found out the house turned out to be 205m2 rather than 190m2. Finally, because the professional fees (taxed at 22%) and the build cost (taxed at 10%) are higher, taxes also increased.